Phonons—the elemental particles that transmit both heat and sound—have magnetic properties, according to a landmark study supported by Ohio Supercomputer Center (OSC) services and recently published by a researcher group from The Ohio State University. 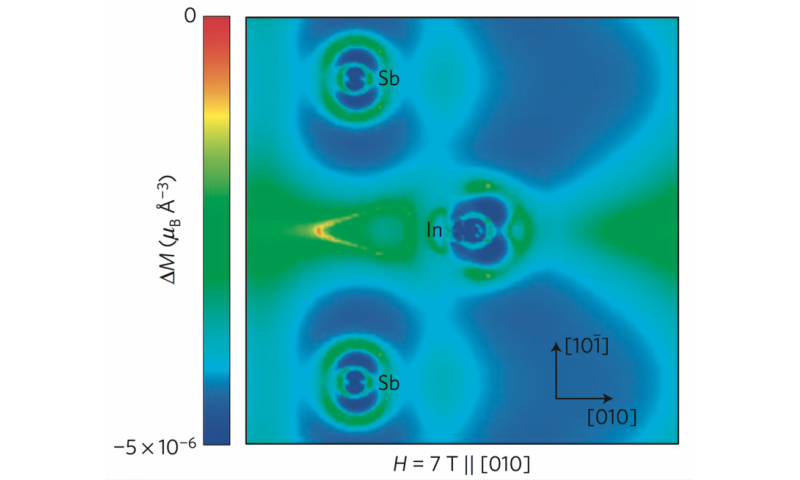 In a recent issue of the journal Nature Materials, the researchers describe how a magnetic field, roughly the size of a medical MRI, reduced the amount of heat flowing through a semiconductor by 12 percent. Simulations performed at OSC then identified the reason for it—the magnetic field induces a diamagnetic response in vibrating atoms known as phonons, which changes how they transport heat. "This adds a new dimension to our understanding of acoustic waves," said Joseph Heremans, Ph.D., Ohio Eminent Scholar in Nanotechnology and a professor of mechanical engineering at Ohio State whose group performed the experiments. "We've shown that we can steer heat magnetically. With a strong enough magnetic field, we should be able to steer sound waves, too." The nature of the effect of the magnetic field initially was not understood and subsequently was investigated through computer simulations performed on OSC's Oakley Cluster by Oscar Restrepo, Ph.D., a research associate, Nikolas Antolin, a doctoral student, and Wolfgang Windl, Ph.D., a professor, all of Ohio State's Department of Materials Science and Engineering. After painstakingly examining all possible magnetic responses that a non-magnetic material can have to an external field, they found that the effect is due to a diamagnetic response, which exists in all materials. This suggests then that the general effect should be present in any solid. The implication: in materials such as glass, stone, plastic—materials which are not conventionally magnetic—heat can be controlled magnetically, if you have a powerful enough magnet. This development may have future impacts on new energy production processes. But, there won't be any practical applications of this discovery any time soon: seven-tesla magnets like the one used in the study don't exist outside of hospitals and laboratories, and a semiconductor made of indium antimonide had to be chilled to -450 degrees Fahrenheit (-268 degrees Celsius)—very close to absolute zero—to make the atoms in the material slow down enough for the phonons' movements to be detectible. 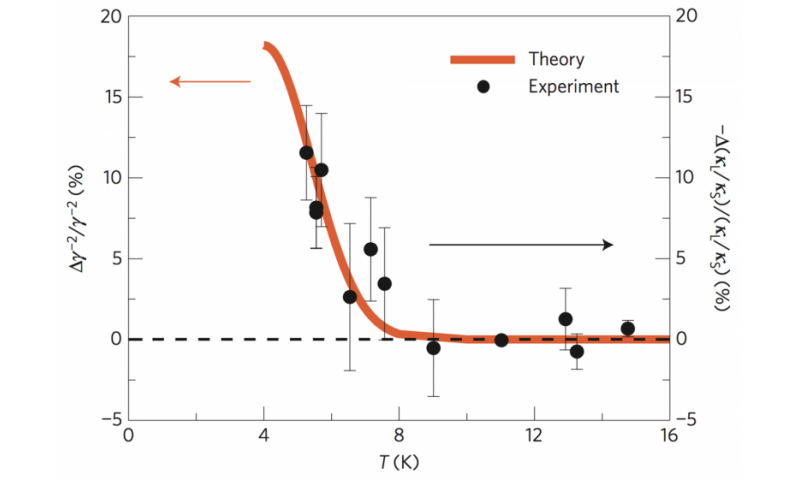 To simulate the experiment, Windl and his computation team employed a quantum mechanical modeling strategy known as density functional theory (DFT). The DFT strategy was used to determine how the electron distribution changed when atoms vibrated with or without magnetic field. The motion of the electrons around their atoms changed in the field, creating diamagnetic moments when phonons were present. These moments then reacted to the field and slowed the heat transport, similar to an eddy current brake in a train. The simulations were conducted on the Oakley Cluster, an HP/Intel Xeon system with more than 8,300 processor cores to provide researchers with a peak performance of 154 Teraflops—tech-speak for 154 trillion calculations per second. Since atoms can vibrate in many different ways, a large number of simulations were necessary, consuming approximately 1.5 million CPU hours even on a machine as powerful as Oakley. OSC engineers also helped the research team use OSC's high-throughput, parallel file system to handle the immense datasets generated by the DFT model. "OSC offered us phenomenal support; they supported our compilation and parallel threading issues, helped us troubleshoot hardware issues when they arose due to code demands, and moved us to the Lustre high-performance file system after we jammed their regular file system," said Antolin, who is the expert for high-demand computations in Windl's group. "Dr. Windl and his team are important OSC clients, and we're always pleased to support their research projects with our hardware, software and staff support services," said David Hudak, Ph.D., OSC's director of supercomputer services. "With the addition of the Ruby Cluster this past fall and another, much more powerful system upcoming this fall, OSC will continue to offer even larger, faster and more powerful services to support this type of discovery and innovation." Next, the group plans to test whether they can deflect sound waves sideways with magnetic fields. Calling phonons elemental particles is incredibly misleading. Like all "quasiparticles," phonons aren't actually particles at all. They're a collective excitation, which we can treat like a single particle to make the math easier. (If you've heard of "electron holes," that's a good analogy for what quasiparticles are; it's easier to keep track of an empty spot in a sea of electrons than to calculate where every electron around it moves). The study itself is cool and might eventually lead to medical applications. For example, doing magnetic fluid hyperthermia without actually needing specially prepared nanoparticles. It is presented as a breakthrough in concept of general science but magnetic field affecting sound wave is nothing new for example in magnetized plasma. There is well known class of electromagnetic waves with significant compressional component called MAGNETOSONIC or magneto-acoustic for their sound component and it's all in the realm of classical plasma physics. If magnetism can control heat, is it possible that the known magnetic fields of galaxies and stars can provide a lensing effect on background light? Thus, not needing an abundance of dark matter to explain the observed lensing. Would it also be possible that light traveling through a magnetic field could be redshifted from an outside perspective? A newly released lecture series which is directly related to this research.